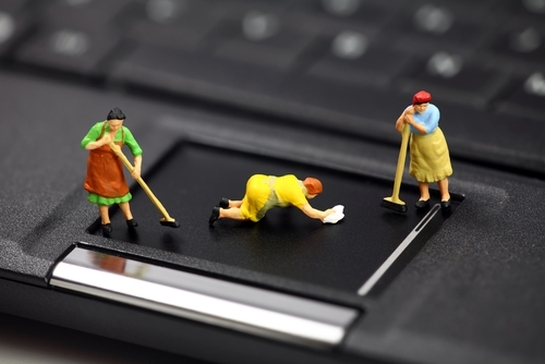 Spring Cleaning For Your Digital Devices | SafeT Systems | Easy. Enjoyable. Secure. Spring has finally sprung, and it looks like your house isn’t the only thing that needs a thorough spring cleaning. Every season, it’s a good idea to make sure your digital devices are up-to-date, but when the warmer months are upon us, it’s especially wise to make sure your security systems are working like new. There’s no need to take up valuable space with files you don’t and will never use. Precious photos and home videos can so easily get lost in the clutter. If you don’t already, make a singular home for these kinds of data. No one likes to look at a cluttered disaster of a desktop screen, no matter how “organized” the chaos- your eyes (and productivity) will thank you. Similar to #1, programs take up the most space in our devices. Cleaning these up regularly will ensure you have enough space for the important things. It’s a good idea to change your passwords every 6 months, but even once a year is better than not at all. This is the most effective tip that will keep unwanted company out of your devices (and home). The one thing this aims to prevent – the “Oh !#^&%” moment when something extremely important cannot be recovered. Not only does this make your machine run more efficiently, but it also prevents data from becoming obsolete over time. Temporary files should be just what the name indicates- not on your device forever. Anti-virus, Anti-spyware, Anti-phishing and firewalls are an unprotected Internet’s best friends. This basically means that your computer is getting rid of the duplicate information that causes data to be read slower than necessary. Long story short, “defragging” your hard drive makes it run faster, and who doesn’t want that? This is essential for security programs to properly update, and if program updates are not installed, your machine will run more slowly than ever. With all the updates in technology, devices are starting to work together like they belong together. Integrating your systems is the best way to ensure their optimal functioning and ease of use. Are your profiles private? How many “friends” do you have that you don’t really know? This is sometimes the best decluttering of all. Security models update frequently because they are proven to do something better or different from the models preceding. In order to have the peace of mind we’re all searching for in terms of security systems, it is a great idea to stay up-to-date on the new developments. Weed out those expired coupons and past-dated information, and you’ll be pleasantly surprised how easy it is to find the information you actually need.